What do you do with those cute miniature roses that you buy at the supermarket as a "last minute gift?" Glam it up and use it as a "climbing rose" trained over an arbor in a miniature rose garden! Miniature roses are ideal miniature garden plants because they are compact, bloom when small sized and can be used in a variety of ways! Take miniature roses out of their pots and make them the star of a container "miniature rose garden!" When you add a miniature arbor, the rose becomes a"climbing rose" and some carefully selected herbs can stand in for trees, shrubs and even grass! It's an easy project- I put it together on NBC's "iVillage Live" show in less than 5 minutes. It's a great idea for using a common and affordable plant to make a unique and special gift that looks expensive! Note: Miniature garden decor weathers best if made of metal, resin and or treated wood. Miniature gardening or "Fairy Gardening" is on the list of growing gardening trends these days. You can find miniature decor, tools and accessories at the following sites. Insert the arbor and plant the mini rose against it. Tie the rose to the arbor sturdy ties and trim away extra stems so that it has a slim profile. Add a few small pieces of flagstone on top of a piece of landscape fabric or weed cloth to keep the stones from sinking into the soil. Place the picket fence around back of the pot and add your birdbath! Add some decorative moss and you are done! Use Irish moss, baby tears , sedum, or any low growing ground cover to simulate a lawn. If you have a larger planter, add small-leaf herbs such as oregano or thyme and prune them as "shrubs" in the landscape. Topiary rosemary or compact Myrtus can be pruned and used as miniature "trees" in the miniature garden. Herbs are great for the miniature garden because they are regularly trimmed for use in cooking and are natural plants to keep compact. Mini herb garden with Rosemary topiary as "trees," oregano and chives as "shrubs!" Watch this miniature garden featuring the Sun Parasol "Garden Crimson" Mandevilla– a new variety that blooms while small, in a four-inch container! *See more garden projects, before and after landscape photos and the latest in garden design with regular visits to Shirley Bovshow's EdenMakers Blog! Those are some neat little mini gardens. I bought mine at my local garden center. You may want to do a google search for miniature garden decor. I bet someone sells this stuff online. Thanks Frances/ This mini rose garden was what I made my mom on Mother’s Day. She loved it! 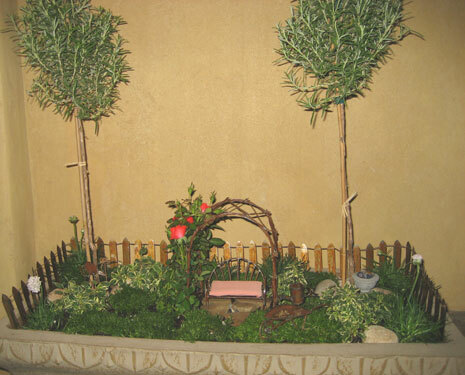 Excellent presentation….will encourage people to have a miniture rose garden. Ideas are great. Thanks Mark for the compliment. I’m on my way to visit your site now. Drop by anytime! This is just so cute! I love the mini herb garden. I made a ‘fairy garden’ with my girls last summer but yours looks much better! I’ve been inspired to have another go now. Thanks Sean. The mini garden with herbs is even a little “better” than a bonsai because you can eat it!! Very creative, its like a bonsai American/English style. Good post Shirley! What a cute and creative idea! A great way to get a child interested in gardening too. This is too pretty. The little garden shop I worked at last year had this mini furniture. We put it in terrariums, birdbath planters, cake plates! with moss and ferns—you can do so much with this idea. We sure share some of the same taste–both good of course!